Last month, I attended an informative webinar called "The District Goes Digital: Leveraging Online Learning for Broader Student Achievement." The main presentation focused on Falcon School District 49, a geographically large district near Colarado Springs, CO. This troubled district brought in Kim McClelland as an assistant superintendent of online learning to help move their educational offerings into the digital world. During the webinar, McClelland shared many of her successes and some of the barriers she faced during this traditional district's transition to blended and online learning. Before the District could remedy the problems present in its public education system, Falcon had to take a candid look at what their needs really were. The district was losing students to other schools and therefore also losing some of their tax base. As a result, the education issues that already existed were compounded by financial shortfalls. Luckily, the switch to online learning helped resolve the problems of underfunding, overcrowding, all while accommodating for an innovative restructing of the district's education model. As a result, the district's students were able to benefit academically given the increased freedom, flexibility, and autonomy that go along with online learning. While the issues affecting Falcon are not the same as those affecting Kamehameha Schools, a look at Falcon School District's experience does result in some interesting ideas that could be applied to the changes occurring here at KS. The classrooms are not overcrowded at KS, but there is an institutional drive to increase enrollment while keeping cost per student stable. Kim McClelland suggests that online/blended learning can be a viable space-creating alternative when adding more physical classrooms is not an option. 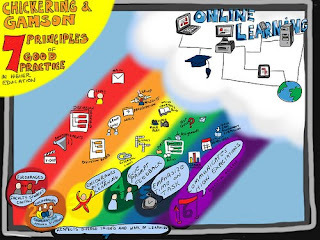 Furthermore, McClelland pointed out that resistance and misconceptions among stakeholders are bound to happen in any school transitioning to online learning. As ISC works towards creating future online courses, we must understand the importance of anticipating these barriers and proactively working to overcome them. Towards the close of her presentation, McClelland offered the following solutions for creating a sustainable online school. First, there should be a three-to-five year plan in place and a consistent vision across top school administrators. Devoting adequate time and resources to stakeholder training is also a key component and should happen at the beginning of each semester. Also, the idea that online learning will save money is not necessarily true. As with any large organizational change, the addition of new support staff and reallocation of physical space is necessary. There were many other tidbits on online learning offered during this webinar, but overall "The District Goes Digital" helped to reconfirm that KS is on the right track with its educational vision. That said, there are still challenges ahead and we would do well to take some of the lessons from Falcon School District 49 to heart.